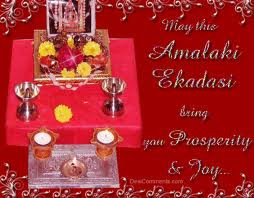 Amalakhi Ekadashi is Coming on 23 March in 2013. 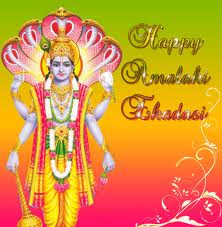 Phalguna Shukla Paksha Ekadashi is known as Amalaki Ekadashi. Amalaki Ekadashi falls between Maha Shivaratri and Holi. Currently it is observed in month of Ferbruary or March in English calendar. 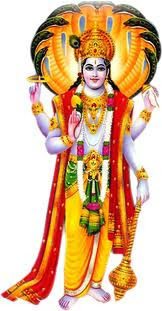 Lord Vishnu, major god of Hinduism and Indian mythology, popularly regarded as the preserver of the universe. 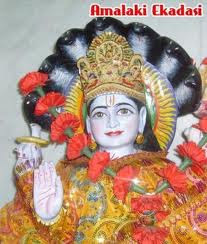 Vishnu is the principle that sustains and preserves. Among the forces of nature, it is equilibrium. Whereas Brahma is called the "creator," it is Vishnu who "sustains the planets in their orbits" and rules the natural progression of the seasons and the ages. 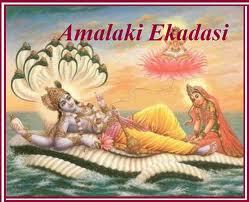 Vasishtha Muni said in Brahmanda Puran "Listen as I describe the best of all fast days, Amalakii Ekadashi. He who faithfully observes a fast on this Ekadashi obtains enormous wealth, gets free of the effects of all kinds of sins, and attains liberation. Fasting on this Ekadashi is more purifying than donating one thousand cows in charity to a pure brahmana." King Mandhata once said to Vasishtha Muni, "O great sage, kindly be merciful to me and tell me of a holy fast that will benefit me eternally." Vasishtha Muni replied. 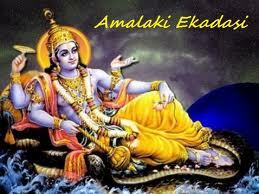 "O king, kindly listen as I describe the best of all fast days, Amalaki Ekadashi. He who faithfully observes a fast on this Ekadashi obtains enormous wealth, gets free of the effects of all kinds of sins, and attains liberation. Fasting on this Ekadashi is more purifying than donating one thousand cows in charity to a pure brahmana. So please hear me attentively as I tell you the story of a hunter who, though daily engaged in killing innocent animals for his living, achieved liberation by observing a fast on Amalaki Ekadashi following the prescribed rules and regulations of worship. "There was once a kingdom named Vaidisha, where all the brahmanas, kshatriyas, vaishyas, and shudras were equally endowed with Vedic knowledge, great bodily strength, and fine intelligence. Oh lion among kings, the whole kingdom was full of Vedic sounds, not a single person was atheistic, and no one sinned. The ruler of this kingdom was King Pashabinduka, a member of the dynasty of Soma, the moon. He was also known as Chitraratha and was very religious and truthful. It is said that King Chitraratha had the strength of ten thousand elephants and that he was very wealthy and knew the six branches of Vedic wisdom perfectly. "During the reign of Maharaja Chitraratha, not a single person in his kingdom attempted to practice another's dharma (duty) so perfectly engaged in their own dharmas were all the brahmanas, kshatriyas, vaishyas, and shudras. Neither miser nor pauper was to be seen throughout the land, not was there ever a drought or flood. Indeed, the kingdom was free of disease, and everyone enjoyed good health. The people rendered loving devotional service to the Supreme Personality of Godhead, Lord Vishnu, as did the king, who also rendered special service to Lord Shiva. Moreover, twice a month everyone fasted on Ekadashi. "In this way, O best of kings, the citizens of Vaidisha lived many long years in great happiness and prosperity. Giving up all varieties of materialistic religion, they completely dedicated themselves to the loving service of the Supreme Lord, Hari. 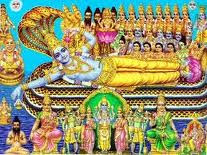 "After bathing in the river, the king and all his subjects went to the temple of Lord Vishnu, where an Amalaki tree grew. First the king and his leading sages offered the tree a pot filled with water, as well as a fine canopy, shoes, gold, diamonds, rubies, pearls, sapphires, and aromatic incense. Then they worshiped Lord Parashurama with these prayers: 'Oh Lord Parashurama, Oh son of Renuka, Oh all-pleasing one, Oh liberator of the worlds, kindly come beneath this holy Amalaki tree and accept our humble obeisances. Then they prayed to the Amalaki tree: 'Oh Amalaki, Oh offspring of Lord Brahma, you can destroy all kinds of sinful reactions. Please accept our respectful obeisances and these bumble gifts. 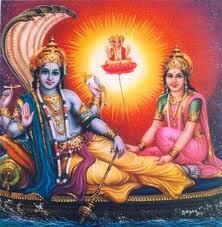 O Amalaki, you are actually the form of Brahman, and you were once worshiped by Lord Ramachandra Himself. Whoever circumambulates you is therefore immediately freed of all his sins. "After offering these excellent prayers, King Chitraratha and his subjects remained awake throughout the night, praying and worshiping according to the regulations governing a sacred Ekadashi fast. It was during this auspicious time of fasting and prayer that a very irreligious man approached the assembly, a man who maintained himself and his family by killing animals. Burdened with both fatigue and sin, the hunter saw the king and the citizens of Vaidisha observing Amalaki Ekadashi by performing an all-night vigil, fasting, and worshiping Lord Vishnu in the beautiful forest setting, which was brilliantly illuminated by many lamps. The hunter hid nearby, wondering what this extraordinary sight before him was. What is going on here?' he thought. What he saw in that lovely forest beneath the holy Amalaki tree was the Deity of Lord Damodara being worshiped upon the Asana of a waterpot, and what he heard were devotees singing sacred songs describing Lord Krishna's transcendental forms and pastimes. Despite himself, that staunchly irreligious killer of innocent birds and animals spent the entire night in great amazement as he watched the Ekadashi celebration and listened to the glorification of the Lord. 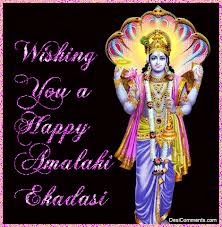 "Soon after sunrise, the king and his royal retinue - including the court sages and all the citizens - completed their observance of Ekadashi and returned to the city of Vaidisha. The hunter then returned to his hut and happily ate his meal. In due time the hunter died, but the merit he had gained by fasting on Amalaki Ekadashi and hearing the glorification of the Supreme Personality of Godhead, as well as by being forced to stay awake all night, made him eligible to be reborn as a great king endowed with may chariots, elephants, horses, and soldiers. His name was Vasuratha, the son of King Viduratha, and he ruled over the kingdom of Jayanti. "King Vasuratha was strong and fearless, as effulgent as the Sun, and as handsome as the Moon. 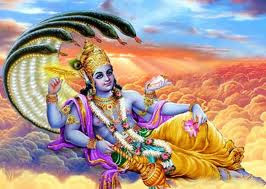 In strength he was like Sri Vishnu, and in forgiveness like the Earth itself. Very charitable and every truthful, King Vasuratha always rendered loving devotional service to the Supreme Lord, Sri Vishnu. 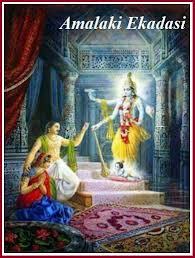 He therefore became very well versed in Vedic knowledge. Always active in the affairs of state, he enjoyed taking excellent care of his subjects, as though they were his own children. He disliked pride in anyone and would smash it when he saw it. He performed many kinds of sacrifices, and he always made certain that the needy in his kingdom received enough charity. "One day, while hunting in the jungle, King Vasuratha strayed from the footpath and lost his way. Wandering for some time and eventually growing weary, he paused beneath a tree and, using his arms as a pillow, fell asleep. As he slept, some barbarian tribesmen came upon him and, remembering their longstanding enmity toward the king, began discussing among themselves various ways to kill him. 'It is because he killed our fathers, mothers, brothers-in-law, grandsons, nephews, and uncles that we are forced to aimlessly wander like so many madmen in the forest.' So saying, they prepared to kill King Vasuratha with various weapons, including spears, swords, arrows, and mystic ropes. "At that very moment he heard a voice from the sky: 'You ask who helped you. Well, who is that person who alone can help anyone is distress? He is none other than Sri Keshava, the Supreme Personality of Godhead, He who saves all who take shelter of Him without any selfish motive. "Upon hearing these words, King VasUratha became over-whelmed with love for the Personality of Godhead Shri Keshava (Krishna). He returned to his capital city and ruled there like a second lord Indra (king of the heavenly regions), without any obstacles at all. "Therefore, Oh King Mandhata," the venerable Vasishtha Muni concluded, "...anyone who observes this holy Amalaki Ekadashi will undoubtedly attain the supreme abode of Lord Vishnu, so great is the religious merit earned from the observance of this most sacred fast day. 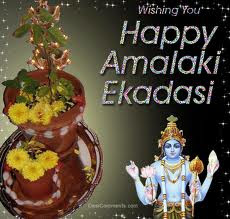 Ekadashi day of the morning before the statue of Lord Vishnu by bathing in the hands sesame, grass, and water exchange with happiness and salvation of Lord Vishnu resolute that I wish would keep the vow of Ekadashi Amlqui. I successfully completed the circle for Mr. Hari keep me in your shelter. After resolution, including Haodshaopachar to worship God. After the worship of God with worship materials amla tree worship. The first clear the land around the tree and make it sacred cow. Urn on an altar at the root of the tree to install. Gods in the urn, and pilgrimages to the ocean Amatraith. Keep the vase gems Ssugandhi and punch. Š ? keep it on the punch Pallava then keep burning lamp. Urn in the gorge of sandalwood paste and Clothing Pehanoan Shrikhand. Urn at the end of the sixth incarnation of Vishnu on Š ? Parshuram (Parshuram Sixth incarnation vishnu) and formally established the golden idol to worship Parshuram law. Bhagwat Katha and chanting hymns in the night to remember the Lord. Daadshi day morning by getting food to Brahmins give alms as well, including the statue of Parshuram Brahmin urn to visit. By devoted to food and water after taking these actions. Furthermore, they eat cooked food only from the next morning. Some devotees follow another method for fasting during Pradhosham Vratam. These eat fruits while observing the vrat and resume with eating cooked food on the same day after the evening prayers . Therefore, the strictness followed during the Pradosha fasting totally relies on the devotee. Nonetheless, there are devotees who do not observe a vrat on this day but offer prayers and worship Shiva either at home or in temples.